You are currently browsing the tag archive for the ‘dorothy dunnett’ tag. And just like that, I’m in love. 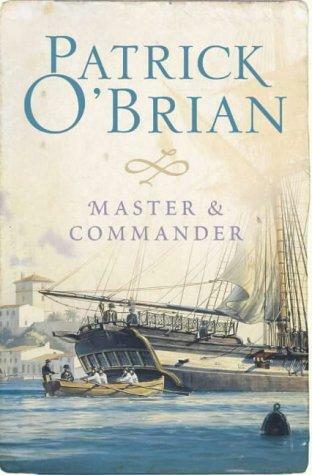 If you like historical fiction, sooner or later you’ll hear about Patrick O’Brian. I’ve been meaning to give him a try for a long time, but was afraid – when I read stories set at sea I often have no idea what’s happening because of the naval-speak, it’s almost like a foreign language. The truth is, I did get lost at times while reading M&C, but I worked for my reward. I used Wikipedia, Google Earth, O’Brian’s fandom, videos of boats maneuvering on YouTube, and watching the movie also helped. Even with this amount of information there were times when I lost my thread, but soon realized that O’Brian uses the same tricks as the wonderful Dorothy Dunnett: they throw you into the action and ask you to go along until everything is explained. That’s when you become aware what an amazing time you’re actually having. Also like Dunnett, O’Brian is completely at easy with cultural references. He mentions obscure details which must have involved a lot of research (see Johnson’s quote below), without insulting the reader with an explanation. The only time he does this is right at the start of the book, when Stephen is taken on a tour of the Sophie, but like us, he also feels an information overload. It’s said O’Brian kept a 1810 edition of Encyclopaedia Britannica close to him while he worked, as well as early editions of Jane Austen, who he thought the finest of all novelists. M&C is first book of a series of 21 (!) books. It’s here that Jack Aubrey and Stephen Maturin meet. Jack is a British lieutenant who’ll soon become master and commander of HMS Sophie and Stephen is a half-Irish/half-Catalan physician and naturalist who’s fallen on hard times and so decides to join the Sophie. I’ve been trying to pin-point what exactly grabbed me so much. There’s 1) the vivid images of life aboard the brig, including the use of language that could be taken out of a real 18th century novel. 2) There’s the wit, which was a surprise until I knew he was an Austen fan. M&C has 4) one of the best opening scenes ever, probably because it’s so unexpected in a book about war and naval life. It begins at a concert. Still strangers, Jack and Stephen sit next to each other. Jack is so focused on the music that he start to tap to the beat. This annoys Stephen so much (Jack wasn’t even being accurate!) that they almost agree on a duel (the start of The Three Musketeers, anyone?). In the end, it’ll be this mutual love of music that’ll unite them. Another favorite was the 5) lovely scene where they play together for the first time. There’s also the camera eye omni, that sees everything but never gets drawn close to anything. There is a variant of that I call Lymondine, which can be seen in Dorothy Dunnett and Guy Gavriel Kay, where you’re usually very closely in somebody’s head but occasionally you pull right away and get a distant perspective. O’Brian’s glide is closest to that, but it’s also really different. He draws in and out almost imperceptibly. It’s very effective and very addictive. It cannot be a coincidence that I’m such a fan of these three authors. If you spot any other good examples of this “camera eye omni”, send them my way. Browsing the fan sites I saw this great quote: “You know that’s not just a series of books, right? It’s a major lifestyle decision. You start reading those and you grow a new space in your brain devoted to them.” I don’t doubt it! *The act or habit of describing or regarding something as unimportant. I’m a big fan of historical novels, they’re more than 1/3 of what I’ve read in the past 5 years, and if I had to take only one genre to a desert island that would be it. As far as that makes me an expert (! ), believe me when I say that Dorothy Dunnett is the best. No one can put me there like she can. I’m always surprised at how she’s not more famous – I only know two people in person that have read her and not that many more in the virtual world. No… to be honest, I’m not that surprised, because I’m always afraid to recommend her, especially to people who don’t read much (sounds snobbish, but it’s not, believe me!). Dunnett can write the most satisfying books, but they’re not a light read. The plot is intricate and there are many characters, at times you don’t know what’s happening until two chapters later a character says something and then there’s glorious light. Dunnett never spoon feeds you and makes you work for your rewards… but oh the rewards! The House of Niccolò series was written after her first books, the Lymond Chronicles, but follow one of Lymond’s ancestors: Nicholas vander Poele, an apprentice in a dye shop in Bruges who, with mathematical precision and the clever use of his dimples, climbs the proverbial corporate leader until he becomes head of the company. In the Lymond Chronicles, each book is set in a different place (Scotland, France, Malta, Turkey, Russia), and Nicholas also treats the world as his oyster. Book 1 starts in Bruges, with glimpses of Geneva, Venice and Milan, and this second book takes us further East. In 1461, 20 years-old Nicholas is in Florence, where he persuades Cosimo de’ Medici to back him up on an ambitious trade journey. He will sail to the Black Sea until Trebizond, last outpost of the Byzantine outpost, and the last jewel missing in the crown of the Ottoman Empire. But things of course never run as smoothly as they should: Nicholas’s younger stepdaughter, 13 year-old Catherine, elopes with his rival in trade: a Machiavellian Genoese who races ahead of Nicholas, setting traps at each port he lands. Trebizond is a key trade connection to the East, and home to a decadent court who refuses to admit that at any moment they may fall to the Turks. Not all traders in the city are that blind and the plot is mined with political and commercial intrigue. As always, Dunnett shows off her meticulous historical research and ability to blends historic characters with fictional ones. The meeting with Cosimo de’ Medici was especially well done – Nicholas gets into the old man’s good graces by enchanting his grandson Cosimino with a yo-yo he made himself. But the highlights are really her descriptions of the wonders of Trebizond, the incense in the air, the languid day-to-day life of its court, the hot-baths, the arrival of the camel caravan. Also, in this immediate-world we live in, I’m also always fascinated by a past where news traveled at a slow pace. People could take months to arrive in Trebizond from Europe, a letter just little under that time, if a ship heading for the destination you want happens to pass by. It really makes me wonder how could anything outside one city could work and… be done. But it did and Dorothy Dunnett, better than anyone, gives you a glimpse at how trade, politics and personal relationships developed in the expanding borders of the mid-XV century. Then, three weeks on their journey, they reached the end of the Black Sea and faced its only exit: the waterway of the Bosphorus, lined by the guns of the Turks. They chose to sail through it in daylight. The ponderous Anadolu Hisari on the Asian shore and, on the right, the massive round towers of Bohasi-Kesen, its new partner. The throat-cutter, they called it; or the strait-cutter; because no ship could survive between the mouths of the two sets of cannon. They entered the Bosphorus, and the gun from Bohasi-Kesen fired. Where Lymond was about dramatic escapades and a world changed by the ideas of the height of the Renaissance, the Niccolò series is about trade, the delicate balance of power it builds, and how it ultimately started globalization. In The Spring of the Ram, the journey undertaken by Nicholas is portrayed almost as a quest, right down to the mythic parallels. The sign of the Ram (or Aires), is the first in the Zodiac. Aires sometimes represent the Golden Fleece, sought by the heroic Jason and his Argonauts, whose steps Nicholas follows on his way to Trebizond. Dorothy Dunnett liked to play these little tricks. In Lymond, the titles were all chess moves and the story reflected it, and with Niccolò they’re all references to star signs. The next one, Race of Scorpions, will take me to Cyprus. I could go straight to it, but I want to make them last. You can only read Dorothy Dunnett for the first time once. Over a month ago I meet a book blogger live for the first time. It was Joanna over at It’s all about me (time). She actually wrote a post about our meeting, and I agree with her: somehow, meeting a fellow book-blogger in person anchored this cyber-world into reality. We’ve been meeting every week for lunch at the bookshop Filigranes and talk about mostly books and what’s new in the book blogosphere. We even came up with an idea for a book challenge which we’ll share soon. 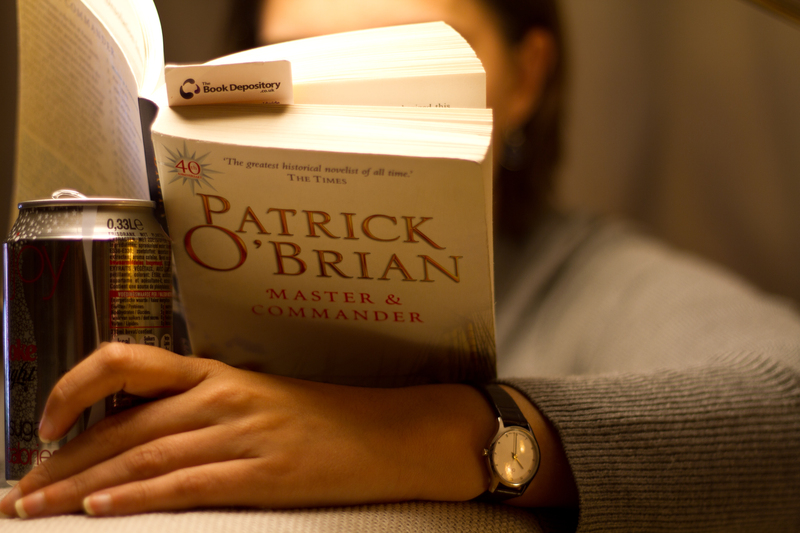 The last time we met, Joanna had a new idea: why not exchange 5 book recommendations to us to read over 2011? (I think Nymeth did this previously with another blogger with good results) So we almost immediately started working on our respective lists. There are no particular rules for the choice of books, but it would be ideal if they would include some books that we think the other will like, some that the other never heard of and some that will take the other out of their comfort zone. I’m always curious about discovering new genres I’ve never heard of (like poetic prose), but this time not even Google seems to be able to give me an answer (gasp!). I’ve read the term for the first time yesterday, in is this great post about the importance of Dorothy Dunnett in the literary and art history of Scotland. I actually got a little teary at times while reading it. It was written based on a talk the blogger gave during the “Fife Local Heroes and Dunfermline Diamonds” celebration of famous people born in the areas. Is it something like the equivalent of “high-fantasy”? Epic and ambitious? 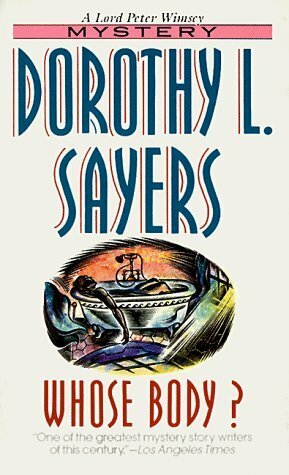 So here it is, the review I’ve been most looking forward to and at the same time fearing: how do I do justice to Dorothy Dunnett? 2009 was my Dorothy Dunnett year. In April I started the Lymond series and finished the sixth and last instalment in December. They had been highly recommended by the two only people I know in person that have ever read DD. They warned me the first two books were challenging, but that the full series would be one of the most rewarding reading experiences I’d ever have. And they were right. So people end up looking at me suspiciously and asking why I like the books so much. I’m a bit all over the place here, but I hope a bit of my enthusiasm seeps through. I was raving about her so much that for Christmas my boyfriend offered me the complete House of Niccolò series. When I picked up Niccolò Rising, I carried it around in my bag waiting for the right moment to start. You can only read a DD book for the first time once! 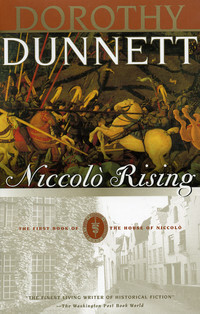 Niccolò Rising is the first of the House of Niccolò’s eight books. Dunnett meant them to become a fourteen-volume work including the Lymond Chronices. The Lymond Chronicles were written before Niccolò but is set at a later time, telling the story of descendants of characters in The House of Niccolò in the following century. It’s set in mid-15th century Europe, mostly in Bruges (Flanders), Geneva and Milan. Bruges is just around the corner – Belgium’s own Disneyworld-like, perfectly preserved, medieval city – and now I’ll have to get back there and look at it with new eyes. 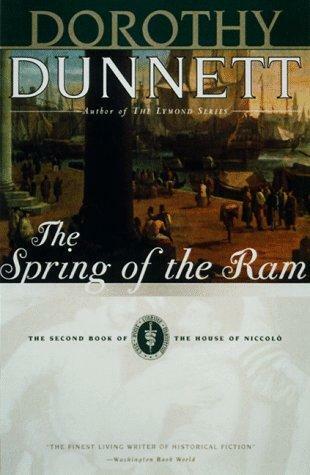 The entire series focuses on the life of Nicholas/Niccolò, who when the book opens is a 19-year-old dyer’s apprentice. He has a gift for numbers, puzzles and codes, all of which he uses to advance his plans. Throughout the story he rises in the world to become an international courier and merchant, spy, banker and mercenary. Almost from the first pages of Captain Blood I thought it would make a perfect Errol Flynn movie, so you can imagine my joy when I found out that such a movie really existed. Captain Blood will happily be a part of two of my challenges: “Read the book, see the movie” and Historical Fiction. This is my second Rafael Sabatini. I don’t remember why I picked up Scaramouche early this year, but after the fun I had I wanted to read more of him. 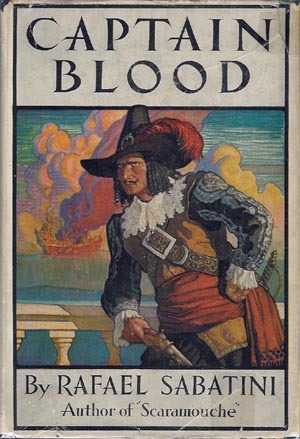 As with Scaramouche, I heard Captain Blood in an audiobook read by Robert Whitfield – his flawless pace and clear diction were ideal for my mind’s eye to picture in detail all the sea battles and land invasions. As the story goes, Peter Blood, a country doctor during the reign of James II, was minding his own business and geraniums when he is called to attend a friend injured during an attempt to de-throne the King and put in its place the Duke of Monmouth. For this kindness, Blood is accused of treason and sentenced to slavery in the British colony of Barbados. Bought by the malevolent Colonel Bishop of the Barbados Militia, Dr Blood’s medical training soon becomes highly valuable in the island. There he also meets Arabella, the niece of Colonel Bishop. Between them there is from the start an obvious attraction and some of the books’ biggest delights is following their sharp-witted clash of minds and see them plunging deeper into endless misunderstandings (it’s like Jane Austen with an edge!). Blood’s dialogues with his enemies are also particularly well done and beyond what you would expect from a typical pirate story. 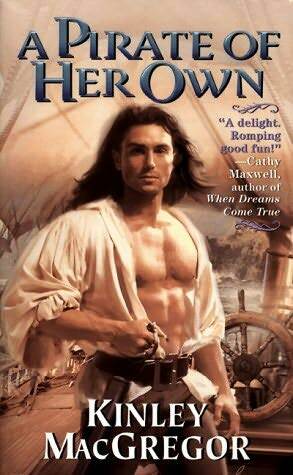 Some months after their captivity, Peter Blood and a group of his fellow slaves take over a Spanish ship and although the now Captain Blood finds freedom, he has no alternative but to become a pirate. It’s a risky and harsh business, but our hero is a natural! A gentleman-pirate, he does what he must while always following a strict moral code – “He’s chivalrous to the point of idiocy“. The story includes piracy grand-scenes, clever strategies, near misses and cannon hits. 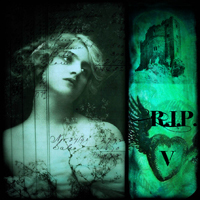 There’s treasure, kidnapping and enough romance to keep the romantics entertained. Some scenes go by too fast and there are quite a few lucky coincidences, but in the end it’s a swashbuckling classic I really enjoyed it. This seemingly outsized swashbuckler was actually a very economical production, using stock footage from several silent films. Captain Blood transformed the 26-year-old Errol Flynn into a star; he’s a little clumsy in the dialogue department at times, but cuts a dashing figure in the action scenes. The clumsiness of dialogue is especially noticeable when Flynn is half-heatedly attempting an Irish accent, but even that is forgettable once he shows his dimples. The book was first published in 1922 and I think the 1935 movie really captures it’s mood: they are both unpretentiously fun. IMDB tells me there’s a re-make in the works (what’s with all the remakes lately, is there no other books/ideas to pick-up? ), to come out in 2011. Let me know if you know who’s playing the lead! Here’s the 1935 trailer – the drama!